Deputy Prime Minister and Funcinpec secretary general Nhek Bun Chhay in 2009. Deputy Prime Minister Nhek Bun Chhay has acknowledged that one of his advisers served as a paid representative of a firm that transferred a 3G telecommunications license to a Hong Kong-based company from which Nhek Bun Chhay has been accused of accepting bribes. Former Funcinpec member Bun Tha, publisher of the Khmer Amatak newspaper, filed a complaint against Nhek Bun Chhay with the Anticorruption Unit this week accusing the deputy prime minister and Funcinpec secretary general of agreeing to use his political influence to aid an unnamed Chinese telecommunications company working with the Hong Kong-based firm Speedy Best Technology. The complaint is based on documents circulated earlier this year including an alleged contract dated June 7, 2008, stating that Nhek Bun Chhay and another company, Kahua Industry Investment Co Ltd, had obtained a 3G telecommunications license from the government that they agreed to transfer to Speedy Best. Speedy Best was apparently created as a joint venture between Funcinpec and the unnamed Chinese company, according to the contract. The contract states that Nhek Bun Chhay agreed to use his “influence and power as General Secretary of Funcinpec Party and deputy prime minister” to aid the Chinese company. Nhek Bun Chhay has rejected the contract as a forgery but has admitted serving as a “witness” to a transaction in which Speedy Best paid Kahua US$5.8 million for an 80 percent share of a 3G license. Some $2.5 million of this payment was then diverted to Nhek Bun Chhay as a “loan”, the Funcinpec secretary general said, adding that his adviser, Ith Sarik, had received $500,000 for serving as a Kahua representative in Cambodia. In a statement issued Wednesday, apparently from Guangzhou, China, Kahua chairman Chan Bei Chuan said Nhek Bun Chhay ultimately “received in cash from Mr. Hong Long only US$1,000,000.00 and from Mr. Ith Sarik only $500,000.00”. “The transferring of 80% shares and the cost of US$5,835,600.00 is only the business between Kahua Industry Investment Co Ltd and the Speedy Best Technology Co Ltd under the witness of Gen. Nhek Bun Chhay,” Chan said. An additional contract document obtained by The Post, dated August 12, 2008 and signed by Chan and Nhek Bun Chhay, states that the $2.5 million loan “shall be reduced … from the 5% profit given to Mr.
Joe Heng, an associate partner at the Malaysia-based accounting firm Baker Tilly Monteiro Heng, whose business card is copied on one of the alleged receipt documents, said this week that he had never heard of any of the parties in the transaction and had not been involved. Nhek Bun Chhay said yesterday that Speedy Best’s 3G license had since been revoked by the government, and that Kahua had “another business” in Cambodia but was no longer working in the telecoms sector. Minister of Posts and Telecommunications So Khun said he was travelling and could not comment, as did the ministry’s director general, Mao Chakrya. Kahua and Speedy Best representatives could not be reached for comment. 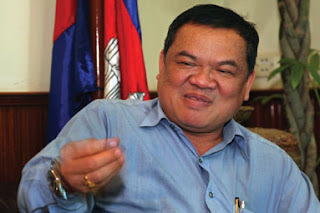 Nhek Bun Chhay said yesterday that he had used the loan he received to renovate Funcinpec headquarters in Phnom Penh. Funcinpec president Keo Puth Reaksmey said, however, that he was unaware of the transaction. “So far, the Funcinpec Party has never borrowed money from anyone to resolve a problem,” he said. Simon Perkins, CEO of mobile operator Hello, said he had never heard of either Kahua or Speedy Best being involved in the telecoms sector. These companies, he added, are likely “just covers for something else”. According to the Hong Kong government’s business registry, Speedy Best was established in April 2007 with just 10,000 Hong Kong Dollars (US$1,282) in registered capital. The company’s listed director is Tsuyoshi Yamashita, a Japanese national. Funcinpec has been wracked by internal divisions since the return to politics last year of former party leader Norodom Ranariddh, who now heads the Norodom Ranariddh Party.